Frenchs Forest, The Craftsman's Press, 1984. Oblong folio, 143 pages with 76 plates (35 in colour). Cloth; a very fine copy with the slipcase. The deluxe edition; this is number 121 of only 200 copies signed by the artist. 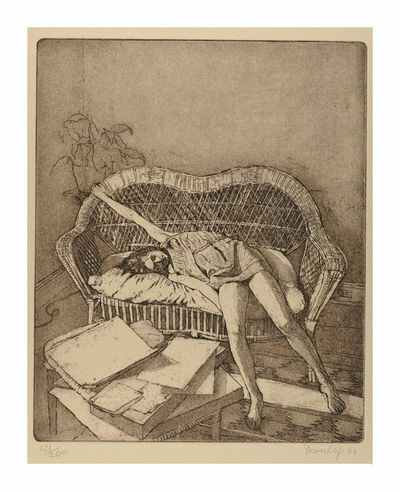 Loosely inserted, and as issued, is an original signed etching, numbered to match (paper size 330 x 255 mm; image size 200 x 165 mm). Tristar Pictures, Inc, Los Angeles 1984 - Screenplay. Spiral bound mimeographed sheets in unprinted red card wrappers. A small stain on the edge of the first few pages, very good or better. Stated "A.P. 's Final Draft March 5, 1984" indicating the director of the film, Alan Parker, who won the Grand Jury Prize for the film at Cannes. The 1984 film, based on the novel by William Wharton, featured Matthew Modine and Nicolas Cage. Collins. 1984. 8vo. Original cloth; text block a little browned as usual, spine of wrapper very slightly sunned, otherwise a very nice copy in price-clipped dust-jacket. First edition, first impression, in the second state dust jacket as usual. The publisher initially printed the incorrect price on the jacket, and this error was resolved by clipping the jacket and applying a sticker for £9.95, as in this copy. Very few survived with the original price. An attractive copy of one of the most difficult Aubrey titles to find in nice condition, with only the very slightest loss of the bright red to the spine of the wrapper. Hardcover. Unpaginated, folio. Hardcover. Fold-out slc containing 12 folders, each containing a print. Line drawing portraits of Lao-Tsu, Michelangelo, Erasmus, Rembrandt, Goya, Beethoven, Daumier, Lincoln, Dostoevsky, Tolstoy, Gandhi & Dorothy Day. Boards fine, Folders & pgs fine. . Fine. circa 1984..
A hand-crafted, limited edition of a short story written in the 1930s (original appearance was in The Long Valley). This is copy 180 of 250 such copies and is signedby Stegner and Wikstrom on the limitation page. A Fine book housed in Near Fine slipcase that has some sunning and light shelf wear. Book is in letterpress printed on hand-made paper from Magnani in Italy. 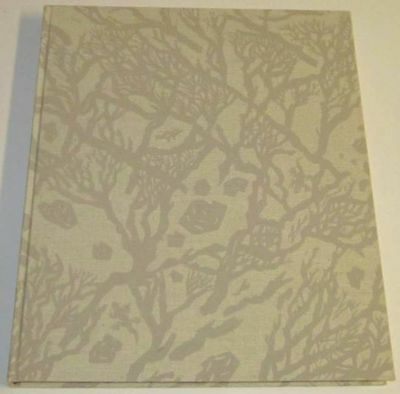 Bound using Dutch linen with decorative design. The color illustrations have been tipped-in. A thank you note is laid-in as is a reprint of Art Seidenbaum's review, which appeared in the Los Angeles Times Book Review of Sunday, June 10,1984 (this sheet is Very Good with several folds and ceases). The book is approximately 10 by 12 inches. Included is a separately bound, in wraps, Fine copy of Stegner's Afterword. Over-run sheets from the book were used by the publishers to produce this unsigned version of the Afterword, which included one of Wikstrom's illustrations. Apparently they used these as presentations - number of copies is unknown but undoubtedly small. Boston: Houghton Mifflin, 1984. First Edition. Original Cloth. Near Fine/Near Fine. J.R.R. Tolkien. 8vo - over 7¾" - 9¾" tall. A complete History of Middle Earth, in Twelve Volumes. Houghton Mifflin 1st Edition 1st printings of all 12 volumes. All Near Fine dustjackets are unclipped. #1 Book of Lost Tales dustjacket shows a small closed tear to the bottom corner of the front panel, but very little or no loss. Books #9 & #10 have a few dampstains to the boards, dye has transferred to the inside of the dustjacket, but no other effects from the damp noted. All books have the full numberline 1 - 10 on title verso and/or the publishing date on the Title Page, indicating they are all the 1st printings, or impressions, no book club editions. No previous owners names or any writing in any of the books. No foxing or offsetting in any of the books, except to the exterior edges of a few books. Edited by Christopher Tolkien from his father's manuscripts, detailing the evolution of Tolkien's life long works dealing with Middle Earth. Housed in 3 custom black leather slipcases featuring the Tolkien Monogram with the 'History of Middle Earth', author, editor, and publisher gilt stamped to the covers. 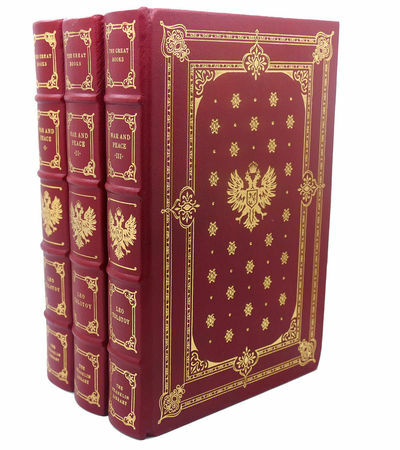 A significant and highly collectable set of this sought after edition. Digital photo's available, inquire if interested. 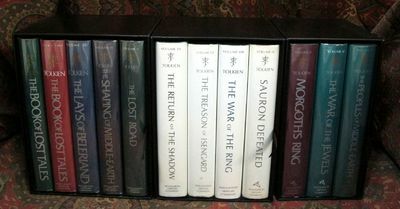 Other Tolkien books available, include both the UK and US editions, original cloth bindings, custom fine bindings, and Signed/Numbered/Limited Editions. Near Fine / Near Fine. London: Victor Gollancz LTD, 1984. First printing. Hardcover. Very near Fine/very near Fine. 278 pp. Price of £8.95 on front flap of jacket. 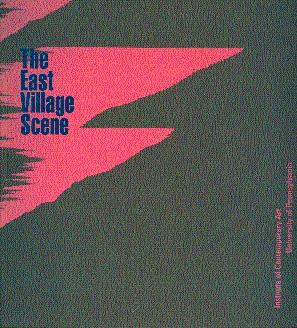 In the first state dust jacket (FIRSTS, October 2010, 30). Inscribed by the author on the title page. 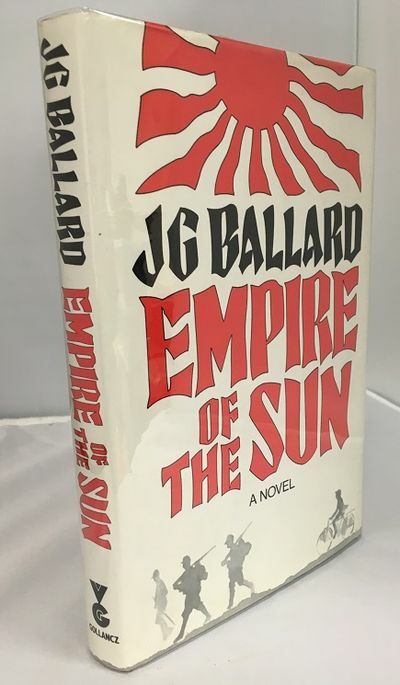 A harrowing novel based on Ballard's experiences growing up during the Japanese occupation of China during the second world war. A very near Fine book with the usual age toning to the pageblock in a like dust jacket with a tiny tear to the front panel. Montpellier: Fata Morgana, 1984. 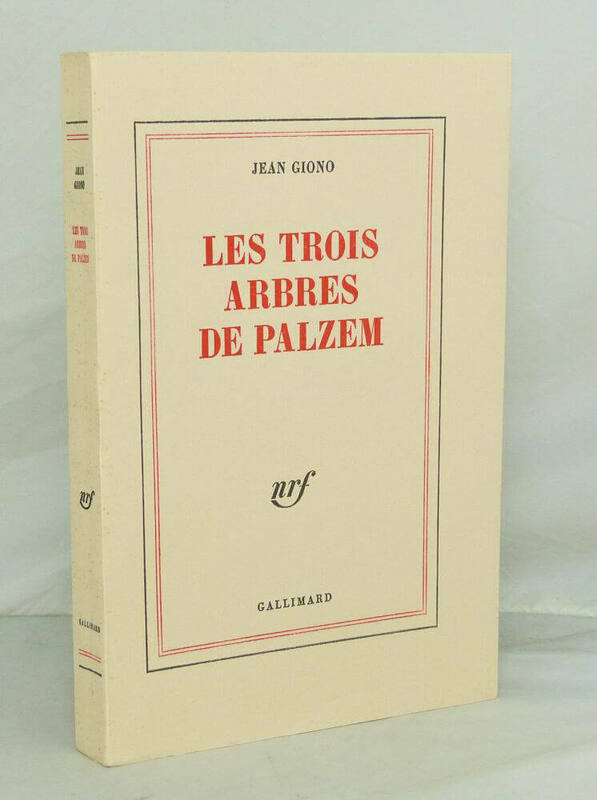 Livre. Illus. 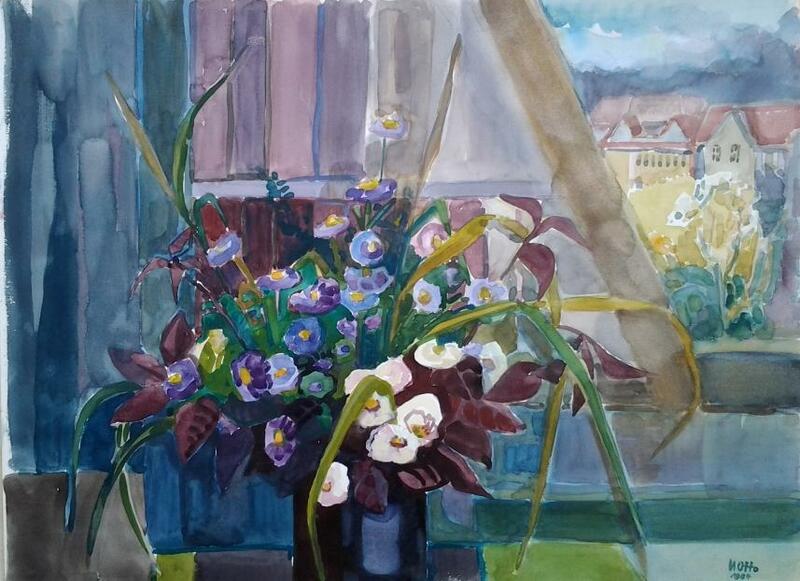 by Reinhoud d'Haese. Très bon. En Feuilles. Signé par l'illustrateur. 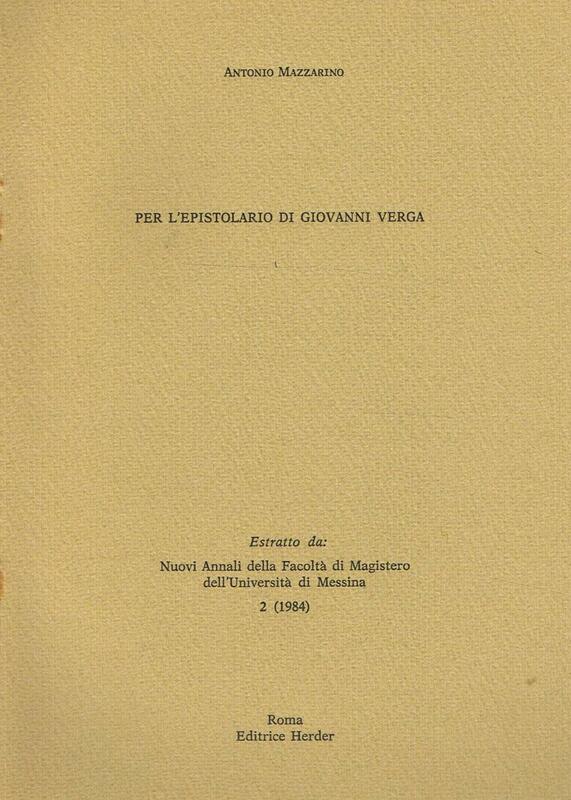 Petit In-Folio. Sl [Montpellier], Fata Morgana, 1984. 32,5 x 24 cm, petit in-folio, 14 ff. n. ch. (28 pp.) y compris les 5 gravures originales signées en relief et en couleurs hors texte, en feuilles sous couverture blanche à rabats imprimée, étui de l'éditeur. Tirage unique à 40 exemplaires (et 12 HC), tous sur vélin d'Arches (n° 8). Les somptueuses gravures de Reinhoud sont toutes signées et justifiées. Bel exemplaire..
New Britain, CT: Massmann, Robert, 1984. Two volumes. (20); (8)ff. 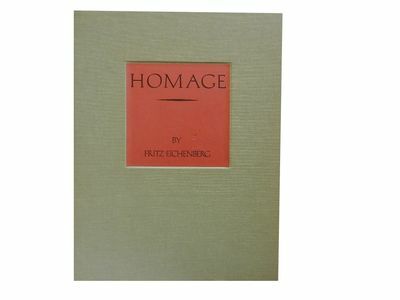 One of 100 copies printed, designed, entirely constructed, and signed by Robert E. Massmann. Volume one is in the shape of the front of Dard Hunter's Lime Rock paper mill. 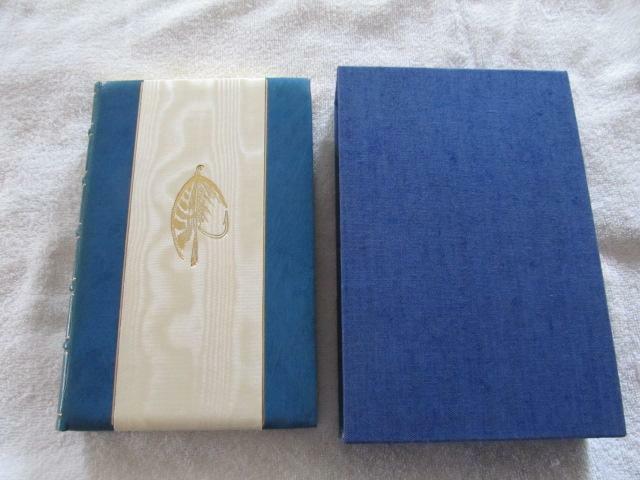 Volume two, which contains paper samples, is bound as a disc with half-round pages opening two ways. The text was printed separately, then cut out and mounted on the leaves. 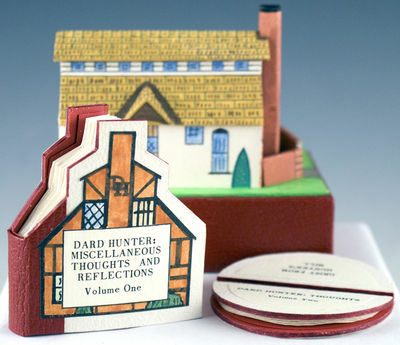 Both volumes are housed in a sculptured construction of the paper mill, a handpainted cardboard model complete with chimney, mansard roof, landscaping, and front gate. According to Massmann, the papers used in the book and the imaginative paper mill slipcase are from the unfinished, last lot produced at Dard Hunter's Lime Rock Mill. This ingenious artist's book is in very fine condition. (Bromer/Edison pp.40-42). (Volume I: 2 3/8 by 2 1/8, 60x53mm; volume II: 2 1/8, 55mm. diameter). Syracuse, NY: Tamarack editions, 1984. First Edition, First Printing. Hardcover. 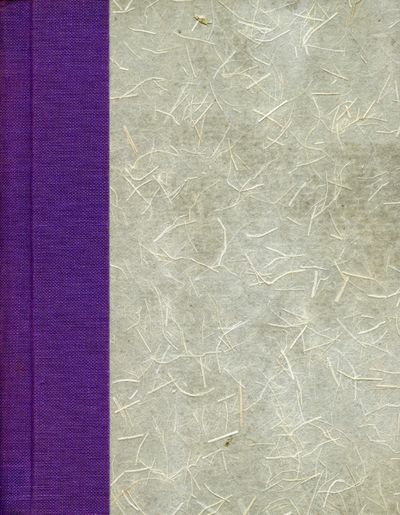 Very slightly sunned at spine, otherwise fine in original purple cloth-backed handmade paper boards.. Thin 16mo. 5 x 6.25 in. Unpaginated. #31/50 copies (out of a total of 300 numbered copies). Signed by Jack Gilbert on the colophon page. Contains the "secret" fifth poem by Michiko printed in blind on the rear end sheet. A treasure, rare in this beautifully bound hardcover issue. New York: Alfred Knopf, 1984. First edition. Cloth. Near Fine/near fine. Large square 4to. 284 pp. 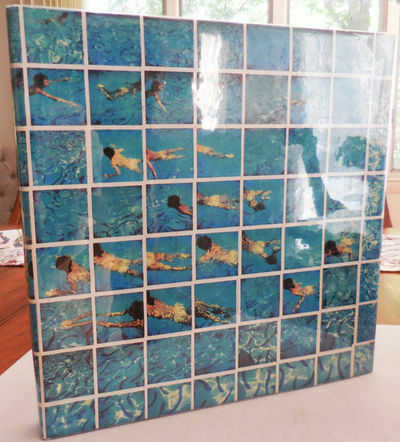 From the essay by Weschler " From March 1981 until June 1983, David Hockney spent virtually all of his creative time in voracious experimentation with the camera. He shot thousands of pictures, and in the end produced more than 350 photocollages that ranged from intimate "sketches" to dizzying panoramas containing a myriad of details and hundreds of micro-perspectives." White cloth covers ever so slightly soiled. One short stray mark to the front endpaper. Otherwise a very handsome near fine copy in dustwrapper. Book contains more than 100 plates of which most are in color. SIGNED in violet ink by Hockney on the title page. Irish Trout and Salmon Flies. (Deluxe Limited Edition). Stultifera navis mortalium in qua fatui affectus, mores, conatus atque studia, quibus vita haec nostra, in omni hominum genere, scatet, cunctis sapientiae cultoribus depinguntur, & velut in speculo ob oculos ponuntur : liber salutaribus doctrinis & admonitionibus plenus olim a clariss. viro d. Sebastiano Brant iurisconsulto, Germanicis rhythmis conscriptus & per Iacobum Locher Suevum Latinitati donatus nunc vero revisus, & elegantissimis figuris recens illustratus. [14 Bl., 2 weisse Blätter] 274 S. [1 Bl.] Mit einer Textholzschnittvignette und 114 Textholzschnitten (ein Holzschnitt ankoloriert) 8 Ganzpergament des 19 Jahrhunderts mit goldgeprägtem Lederrückenschild VD 16, B 7081 Admas B 2673 Brunet I, 1205 IA 123.749 Wilhelmi 248 Kat. Stimmer, Basel 1984, 54a Erste Oktav-Ausgabe der lateinischen Narrenschiffbearbeitung und erste Ausgabe mit den hier vorliegenden Illustraionenen. Die Holzschnitte wurden u.a. von Nagler (Vgl. XIX, 469) Tobias Stimmer zugeschrieben und sind keine blossen Wiederholungen der Dürerillustrationen für die EA von 1494, sondern zeigen eine durchaus eigene Auffasung. Andresen (Vgl. III, 210) schlägt die Schule von H. R. Manuel Deutsch vorschlägt. Etwas gebräunt und im oberen Viertel durchgehend etwas wasserrandig. Komplette Ausgabe vom Probeheft 1984 bis 2015, incl. aller 32 Sonderhefte (1992 - 2015) und Jahresregister (erstmalig erschienen 1989 - 2014). 1985 - 2001: 4 Hefte jährlich ab 2002: 6 Hefte jährl. Sonderhefte erschienen erstmals 1992 bis 2007 jährl. 1 ab 2008 2 pro Jahr (neue Zählung der Sonderhefte ab 2012) 2012 nur 1, dafür 2014 3 Sonderhefte. Das Konvolut von 185 Heften wird nur komplett abgegeben, da es sich um die lückenlos vollständige Ausgabe aller in dieser Reihe bis 2015 erschienenen Bände handelt. Mit zahlreichen Fotos, Zeichnungen und Karten. Bei Selbstabholung erhalten Sie das gesamte Konvolut zum Sonderpreis von 500,-! Yemen del Nord. Venti fotografie inedite di Giancarlo Bertozzini presentate da Mario Giacomelli. 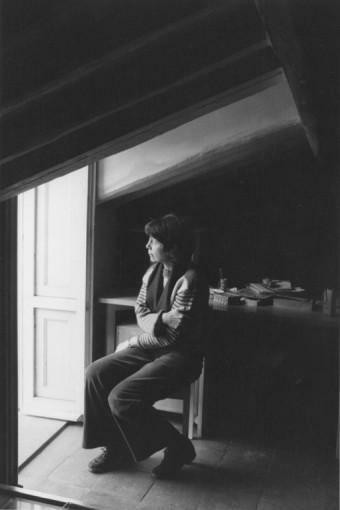 Pesaro, [privately published for the photographer], 1984. Square folio portfolio in the original green cloth box (44 x 41 cm), spine lettered in gilt, the photographer's initials in gilt on front cover; ff. of creme card, including self-wrappers, 20 original colour photos mounted on black cards; only minor spotting or scuffing to cloth box, internally near fine. 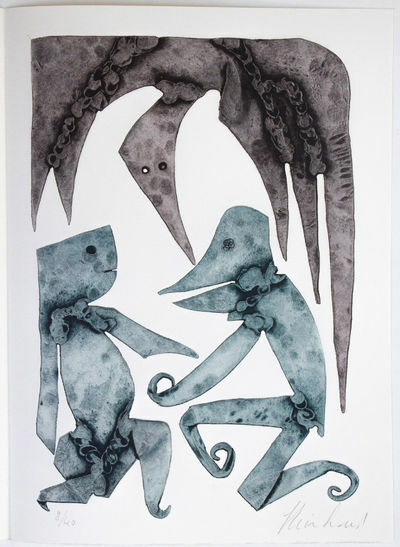 First edition, number 4 of a printrun limited to 60. Facilitated by the artist, printer and book designer Piergiorgio Spallaci, this extremely rare photo book with colour photographs by the Italian post-war photographer Bertozzini, who used a Rolleiflex 6 x 6 (mis-spelled Rolleflex in the text), and a Leica R3 with Kodacolor II 100 as a film, is the result of his journey to Northern Yemen, undertaken in order to capture the ancient civilization, architecture and people. The text is by the photographer colleague Mario Giacomelli, reknowned for his iconic 1957 photo Scanno Boy. No copy traced in any library. In 2013 these 20 photos featured in an exhibition near Pesaro; see under http://www.candelara.com/mostra_bertozzini.php . New York: The Limited Editions Club, 1984. Limited Edition. Leather. Fine. Baskin, Leonard. no. 1107 of 1500, 4to - over 9.75" - 12" tall, 167 pp., signed by author and illustrator. Arthur Miller was an American playwright, essayist, and figure in the twentieth-century American Theatre. In Miller's more than thirty plays, which have won him a Pulitzer Prize and multiple Tony Awards, he puts in question "death and betrayal and injustice and how we are to account for this little life of ours." For nearly six decades, Miller has been creating characters that wrestle with power conflicts, personal and social responsibility, the repercussions of past actions, and the twin poles of guilt and hope. (N. B. info from The National Endowment for the Humanities website). ***ABOUT THE ILLUSTRATOR: Leonard Baskin (1922-2000) was an artistic genius whose works almost defy categorization. 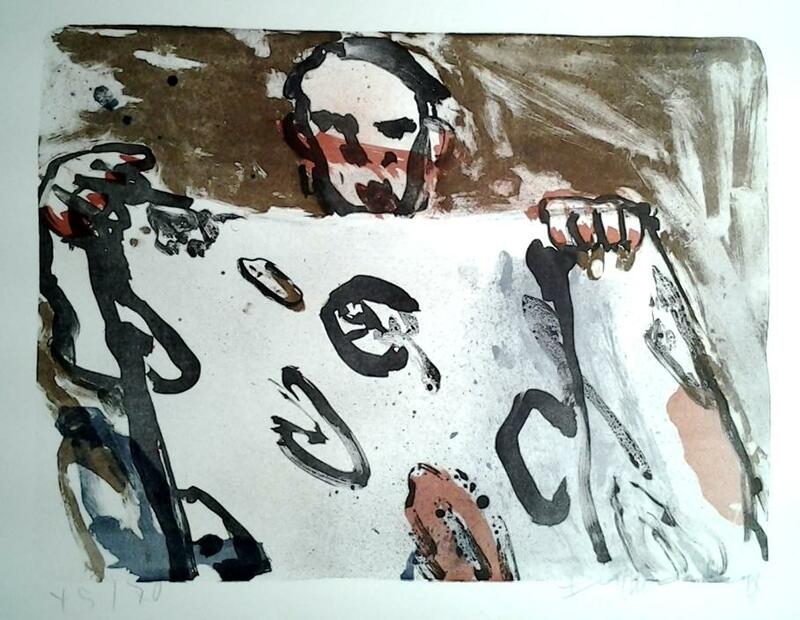 Eminent in sculpting, illustration, printmaking and also as a typographer and printer, he pursued multiple art forms all of which have, as an underlying thread, social consciousness and a high regard for humanity (N.B., above information from the website of the Galerie St. Etienne). Mr. Baskin founded The Gehenna Press in 1942 while at Yale University, taking his inspiration from William Blake's example as both a poet and an artist/bookmaker. ***DESCRIPTION: Bound by Gray Parrot in full rust-brown Nigerian goatskin with gilt lettering on the spine, five tissue-guarded etchings by Leonard Baskin; printed by the Wild Carrot Letterpress, set in American and English monotype Bulmer on mould-made Cartiere Enrico Magnani paper; pagination: (5) - (165), blank (166), colophon (167); 10.5" tall, signed by author Arthur Miller and illustrator Leonard Baskin, Limited Edition no. 1107 of 1500; slipcase bound in grey paper with gilt lettering on the spine. ***CONDITION: Book is in fine condition with the leather binding smooth and supple, the colour on the spine deep (not sunned), corners straight and unrubbed, solid hinges and a strong text block, clean and bright inside and entirely free of prior owner markings. The slipcase is in near fine condition, strong and sturdy with some wear to corners and opening, a bump to the top left corner and very slight bump to bottom right corner. ***CITATION: LEC no. 540. ***POSTAGE: International customers, please note that additional postage may apply as the standard does not always cover costs; please contact us for details. ***Swan's Fine Books is pleased to be a member of the ABAA, ILAB, and IOBA and we stand behind every book we sell. Please contact us with any questions you may have, we are here to help. Collection of 675 nautical charts with a graphic representation of a maritime area and adjacent coastal regions. 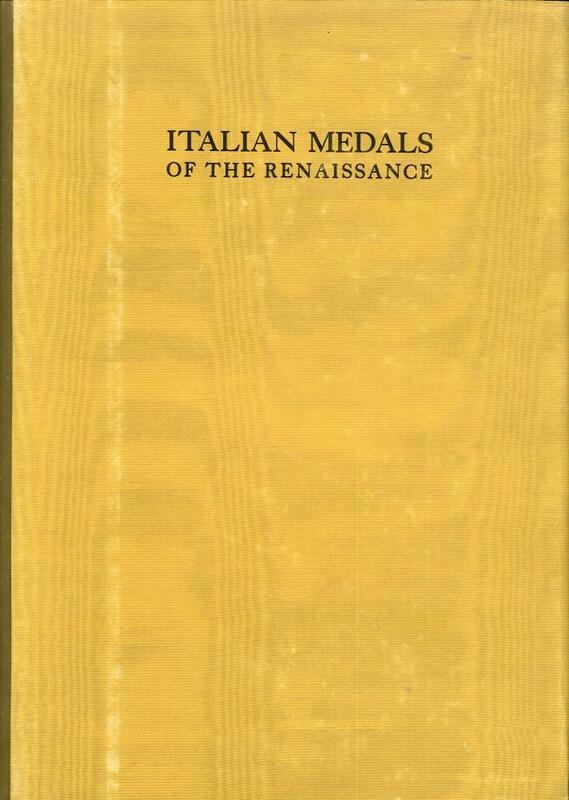 Original and revised editions, several with handwritten additions, printed between 1921 and 1966. Average size ca. 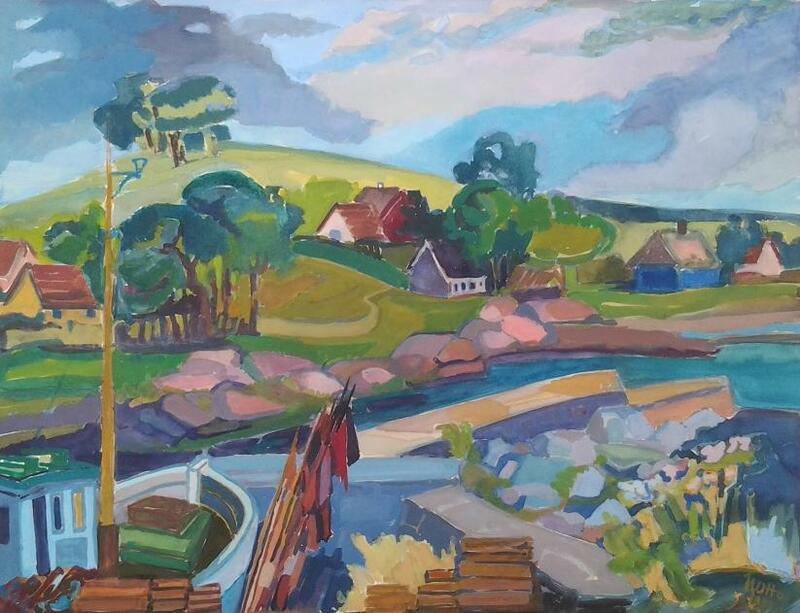 104 x 71cm. Published by:UDGIVES AF DET KONGELIGE SØKORT-ARKIV, KØBENHAVN (8)DEUTSCHEN HYDROGRAPHISCHEN INSTITUT, HAMBURG (2)JAMES HORSBURGH,HYDROGRAPHER TO THE HON. E.I.COMPANY (1)TNI - AL JAWATAN HIDRO-OSEANOGRAFI, JAKARTA (10)HYDROGRAPHIC DEPARTMENT, PORT OF SINGAPORE AUTHORITY (1)SERVICE HYDROGRAPHIQUE DU CANADA (1)MARINHA DO BRASIL (2)HYDROGRAPHIC SERVICE, AUSTRALIA (1)HYDROGRAPHIC OFFICE OF THE ROYAL NEW ZEALAND NAVY (2)YOUNGSFIELD, S.A. (1)RUSSIAN CHART, 1984 (1)SERVICE HYDROGRAPHIQUE DE LA MARINE, PARIS (24)MINISTERIE VAN MARINE, AFDEELING HYDROGRAPHIE, 'S GRAVENHAGE (11)U.S. NAVY HYDROGRAPHIC OFFICE/ U.S. DEPARTMENT OF COMMERCE, WASHINGTON (36)ADMIRALTY, LONDON (413)ADMIRALTY CHARTS, TAUNTON (161)A substantial collection of nautical charts of Europe, the Pacific and Australia, Asia, Middle East, West Indies and America. - In fine condition. - Provenace and a detailed list available on request. 745 x 520mm. Giclée Print using Archival pigment inks on Hahnemüle Fine Art Pearl 285gsm paper. Limited edition of 10 numbered copies signed by the photographer. Alan Davidson is a press photographer based in London for more than 30 years, Alan has photographed the rich, the famous, the before-they-were-famous to those that have fallen from grace. Going through his vast archive, with new treasures found within the old brown manilla envelopes, reads like a who's who of the great and good (and the very bad) of London society. Cinema stars rub shoulders with pop stars, royalty with politicians. Working from the late 1960s to the present day Alan remembers the days before celebrities became surrounded by 30 young publicists and before there were 50 photographers at every event you went to, allowing him to take intimate and relaxed portraits, unlike the anodyne syndicated press shots of today. Los Angeles: Samuel Goldwyn Company, 1984. Style A one sheet poster for the 1984 film. First issue, printed in black and brown (later reproductions are in black and white) and measuring 27 x 41 inches (105 x 89 cm). Later reproductions measure 40 inches in length. This variant shows the film's trio in and around their sturdy automobile, at the end of their journey in a warm climate, with palm trees in the distance.&#11;&#11;Director Jim Jarmusch's first effort, "Permanent Vacation" (1980), was his final thesis at New York University's film school. 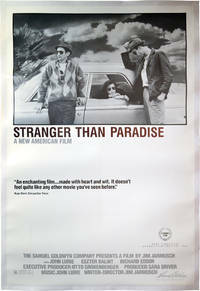 As with the earliest films of Jean-Pierre Melville and David Lynch, he then spent four years making "Stranger than Paradise," shooting as money allowed. &#11;&#11;One of the most evocative pairs of film posters produced in the 1980s, the stunning breakthrough of an auteur who both understood his masters and paved the way for a new kind of cinema.&#11;&#11;27 x 41 inches (105 x 89 cm). Archivally linen-backed and rolled. Fine.&#11;&#11;National Film Registry. Criterion Collection 400. Emily King, p. 155. 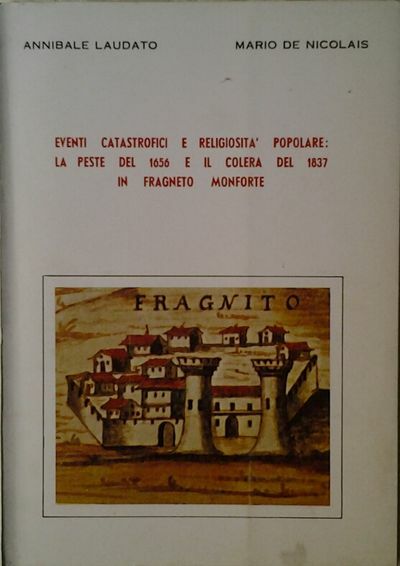 EVENTI CATASTROFICI E RELIGIOSITA' POPOLARE: LA PESTE DEL 1656 E IL COLERA DEL 1837 IN FRAGNETO MONFORTE. Centro Culturale,, 1984.. In-8, brossura, pp. 60, con tavole in bianco e nero nel testo. In buono stato (good copy). Franklin Center Pennsylvania: The Franklin Library. 1984. First Edition; First Printing. Hardcover. Fine, Accented in 22kt gold, printed on archival paper with gilded edges, smyth sewing & concealed muslin joints. Bound In full leather with hubbed spines. Complete in three volumes. A Limited Edition. Franklin Library the Great Books of the Western World Series. ; 8vo 8" - 9" tall . [No place]: Wydawnictwo Kurs, 1984. Near Fine. Quarto. Stapled illustrated newsprint self- wrappers. 16 pp. Illustrateds. Cover slightly stained else near fine. The first Polish underground comic, it tells the story of the first 500 days of "Solidarity." 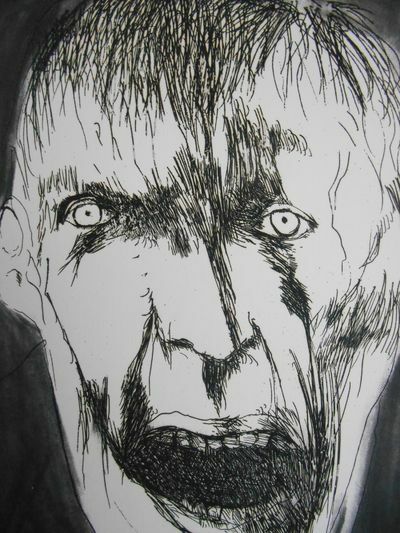 Created by Wojciech Starzynski and Andrzej Witwicki, written by Janowi Markowi Owsinskiemu, and drawn by Jacek Fedorowicz. The comic became very popular in Poland and also outside the country and had several editions in 1984. The work wasn't published officially until 1989. 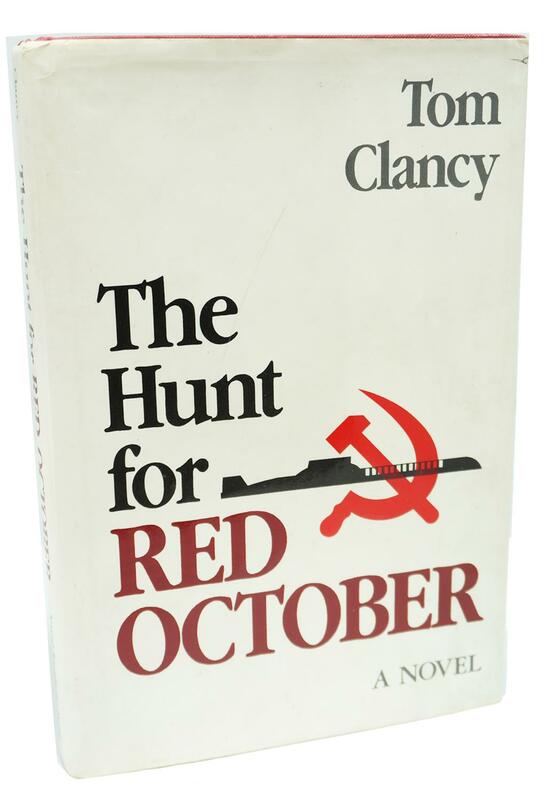 This is the second run or issue with some variations including a drawn list of the characters on the rear cover, and indicating the number of pages.The action begins on August 7, 1980, with the dismissal of Anna Walentynowicz, the event which ignited the strike at the Lenin Shipyard in Gdansk, set off a wave of strikes in Poland, and led to the establishment of "Solidarnosci" (Solidarity), the first independent trade union in the Soviet Bloc that was not controlled by a communist party and later it had a crucial role in the peaceful transition of the communist Poland into the parliamentary democracy. The cofounder and leader of movement was Lech Walesa, who won the Nobel Peace Prize in 1983 and served as the first popularly elected President of Poland from 1990 to 1995. Exceptionally uncommon. Hamburg: Hoffmann und Campe. 1984. 8vo. Original purple cloth and wrapper; pp. x + 374; near fine. Provenance: inscribed by the author to title page "Für Roswitha [Liudocco? ]/ von K. R. Popper". With a loose letter from Popper's research assistant at LSE, Ivan Slade, addressed to 'Rosie' and obviously sent to the recipient along with this copy of the book: "I much prefer the last paragraph of this book to the whole of the so-called Art of Loving [by Erich Fromm]". Slade adds as a postscript: "Popper doesn't sign books except for personal friends: this is the first book I have ever asked him to dedicate look after it (for your granchildren [sic]) x". 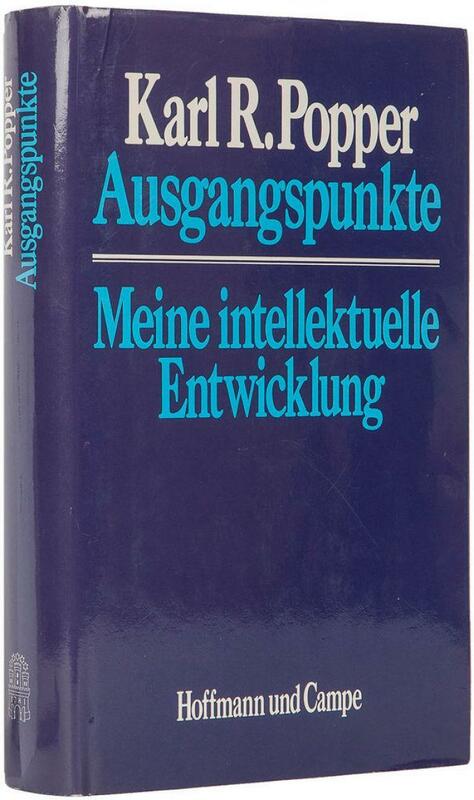 Third German edition. First published in English in 1974 as Unended Quest. An Intellectual Autobiography, this is a revealing account of Popper's life and a gateway to an understanding of his life's work.